@WebDev511 shared their first Lab Rat Report If tannins are your thing it could be a stand alone, but IMHO it really needs food. @aces219 shared a pop and pour Lab Rat Report If you like elegant Cali Pinot, you’ll like this wine, and the price is a lot prettier. @LetsBeFranc hits us with some Notes From the Vintner Cabernet Franc is often thought of as a wine with relative high acid, however it is more the profile of the fruit, more high toned cherry/berry versus cassis and plum, so it gives the impression of higher acid. The 2014 North Coast Cabernet Franc returns to a slightly more tame expression of the grape. This 100% Cabernet Franc provides us with really gorgeous violet, raspberry, and herbal scents. The palate follows with tender integrated fruit flavors and an energy that’s provided by supporting acidity and tannin structure. It is always amazing what a great range of cuisine pairs so easily with this wine, particularly when paired with good friends and family. When we began our exploration of Cabernet Franc, we set out with the goal to present a wine that was ‘true to type’, or, in wine-speak, a wine that showed ‘typicity’ - boldly saying ‘Cabernet Franc’! Our exploration, in progress since 1993, brings us to the rows of many vineyards in very diverse growing conditions. The ‘North Coast’ designation is an approved American Viticultural Area (AVA) that encompasses five counties that are directly affected by maritime influence by touching the Pacific Ocean, San Francisco Bay or Clear Lake. We source Cabernet Franc grapes from four of the five counties – Napa, Sonoma, Lake and Suisun. The diversity of climate, soil and aspect allows us to select grapes with a broad array of characteristics and ripeness so that the final blend is greater than any of the parts. Tracey & John Skupny started Lang & Reed Wine Company in 1996 with the goal to explore the distinct charms of Cabernet Franc and to craft wines that are both expressive and enjoyable to drink. The foundation of their wine experience began almost 40 years ago while working in the restaurant trade in Kansas City. They were trained in the classics: fine wine, fine food, and fine service. Having attained positions as wine stewards (sommeliers), the lure of vineyards and wineries brought them to California in 1980, settling finally in the Napa Valley by 1984. Over the first decade of living in the Napa Valley, John held executive positions at Caymus Vineyards, Clos Du Val Wine Company and the Niebaum-Coppola Estate (Inglenook). Tracey focused on a growing family (Reed & Jerzy Lang) and philanthropic efforts such as the St. Helena Public Schools Foundation and Auction Napa Valley. In 1994, she embarked on the first of two stints working at Spottswoode Estate Vineyard and Winery and has recently completed round two as Sales Director. Since arriving in the Napa Valley, Tracey & John have been actively involved with the Napa Valley Vintners, both serving lengthy tenures on the Board of Directors, acting as Co-Chairs of the 10th anniversary Premiere Napa Valley barrel auction, and participating as members of many subcommittees. John served as President of the NVV and the Auction Napa Valley in 1996, the same year that Lang & Reed became the 125th member of the NVV. During their wine ‘foundation’ years, the Skupnys became intrigued by the magnitude of distinction Cabernet Franc held from notable wine regions in France: Loire Valley and Bordeaux. The early 80’s in Napa Valley found vintners utilizing Bordeaux varieties as components of their red wine blends, and Cabernet Franc was a key varietal. Its critical contribution led Tracey and John to explore the broad range of aromatics and flavors emerging from Cabernet Franc. Inspired on this journey, the Skupnys set out to produce a Cabernet Franc that was ‘true to type’, redolent in aroma, and pure in flavor with, structure and balance. In 1993, a prototype was crafted, Lang & Reed Wine Company was born, and the rest is history. Tracey and John reside in St. Helena with their daughter and an abundant number of dogs, and they are fortunate to have many more family members living nearby in Napa Valley and Anderson Valley. Please tell me you guys made the Toothstejn 2! Getting a case. Let me know if you want any. I’ll take 4 if available. @schristopher524 see the lab rat report just below this. @MarkDaSpark Yeah, but since that vineyard had precisely zero other information I assumed it was an alias for somebody who didn’t want their name out there with that wine. Since this one seemed closer in style and such, I was guessing it might be related. But yes, I’ll take 3, or if you prefer, 4. From my earlier comment/request; might that leave 4 I could claim? Hopefully MdS will check in before rollover. Sorry, thought your post was from klez. If Tim’s friend Adam wants one bottle, then 4 for rjq and 3 for klez. If Adam doesn’t want it, then 4 each. First taste: dark berries, black current, black berries. Not at all jammy, but healthy tannins that should pair well with with rich savoriy dishes which unfortunatly isn’t on our previously planned menu for this evening. Color seems to be more to the red side of things Garnet, could just be a combination of my eyes and different light though. Tasting: the flavors from the initial taste are holding out well. It’s a burst of berries that quickly morphs into a tannic finish. If tannins are your thing it could be a stand alone, but IMHO it really needs food. Rich winter fare wouldn’t be a bad choice. I’m thinking it would go great with a rich creamy soup like potato leek or cream of sweet potato or mushroom. Maybe even a heavy mac & cheese, but that would hinge on the cheese side of the equation as I think this wine might get over powered by anything that was heavy on the Emmenthaler, Gruyere, or Jarlsberg. I like my mac and cheese that way so probably not a good personal example, but something creamy & buttery would complement the tannin. I’ll make sure we have something different tomorrow night and run another follow up. @winer Yes. If you purchased the 4 pack of Casemates glasses on meh.com yesterday, it came with two $8 coupons to casemates.com. @jhkey Did you get them already? Should I have gotten an email or something?? @browncj7 IIRC the coupon code was listed in the sale description. I came back to it after an hour of the glass sitting on the counter and had it with my dinner. Definitely had diminished some. It was good with the food (steak with paprika butter, veggies) but unremarkable. I’d say this is a drink now through the next 5 years. Tannins will smooth out a bit but the fruit might fade, so I don’t see the benefit of waiting. If you like elegant Cali Pinot, you’ll like this wine, and the price is a lot prettier. 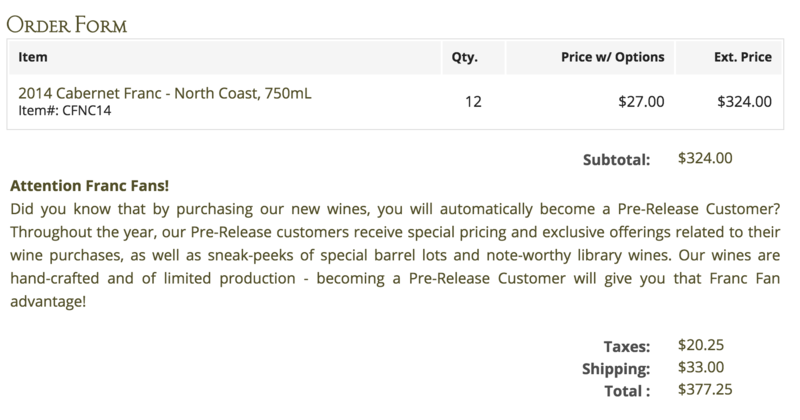 We guessed $20 a bottle for the offering just based on our impressions of the wine, so pleased to see it come in lower. If you like elegant Cali Pinot, you’ll like this wine, and the price is a lot prettier. Thanks! That is super helpful. Also, I like the description of earthiness as always. I guess I’ll have to take Sparky up on his offer. Don’t think I’ve ever seen TA below .5 before. Apparently not flabby, though, since aces even described it as “acidic”. Still, I would consider this a “drink now” kind of wine as it will only soften in the bottle over time and at some point, that low TA is going to be noticeable. @chipgreen I think alcohol is too low to be flabby, but I think it could soften and fade away. Hi gang! Lang & Reed here and happy to answer any of your questions about our 2014 Cabernet Franc - North Coast that’s on sale today. Hi, can you talk about the pH and TA levels - how, why, etc.? Yes, that addressed it nicely - thanks! Cabernet Franc is often thought of as a wine with relative high acid, however it is more the profile of the fruit, more high toned cherry/berry versus cassis and plum, so it gives the impression of higher acid. The acid level in the 2014 is in sync with a slightly high pH… wines in these ranges tend to drink early but our experience, since the mid-nineties, is that balance is the key to longevity… The time one ages a wine is also a very personal choice… I like them fresh, zippy - something to help slake what ever I might be eating with it, now… but have enjoyed them years on, becoming more soft and silky. Iowans interested in splitting a case? @Kildahl We would use one or two more Iowa casemates! This is a good producer of reasonably priced CFs and is an exceptional offer. Anyone in MA/RI want to split a case (evenly or otherwise)? Anyone in the far North ‘burbs of Chicago interested in some fraction of a case?